There are 9 Memory Care Facilities in the Springfield area, with 3 in Springfield and 6 nearby. The average cost of memory care in Springfield is $5,033 per month. This is higher than the national median of $4,650. Cheaper nearby regions include Eugene with an average starting cost of $4,857. To help you with your search, browse the 14 reviews below for memory care facilities in Springfield. On average, consumers rate memory care in Springfield 4.3 out of 5 stars. There are 65,000 seniors 65 and older in Oregon who suffer from Alzheimer's Disease or other dementia disorder. In Springfield, which is home to a little less than 63,000 residents, 13.1 percent of the population is aged 65 or older. In cities like this where seniors make up such a large part of the population, the need for memory care is high. There is a total of nine memory care facilities, which are officially known as memory care communities throughout the state. The Oregon Department of Human Services is responsible for regulating memory care and assisted living facilities throughout Oregon. According to state regulations, although memory care and assisted living services may often be provided in the same facility, a memory care community must be segregated in its own area where other residents may not access it. The cost of living in Springfield is above the national average by six percent. Seniors and their families who have limited funds to pay for the cost of memory care might want to consider facilities in a less expensive area. The Springfield area is home to world-class medical facilities, including those that specialize in brain health and dementia disorders, such as PeaceHealth Sacred Heart Medical Center at Riverbend and McKenzie Willamette Medical Center, in the event of medical emergencies or illness. Crime rates in Springfield are well above state averages. A total of 3.02 violent crimes and 47.94 property crimes occur per 1,000 residents each year in the area. By comparison, state averages are only 2.65 violent crimes and 29.64 property crimes per 1,000 residents. Seniors and their families should inquire about security measures taken by facilities when they're considering memory care. Annual rainfall in Springfield is six inches above the national average. Seniors who enjoy spending plenty of time outdoors may find it hard to do as often living in the area and may wish to consider memory care somewhere with drier weather. Memory Care costs in Springfield start around $5,033 per month on average, while the nationwide average cost of memory care is $4,799 per month. To see a list of free memory care resources in Springfield, please visit our Assisted Living in Oregon page. 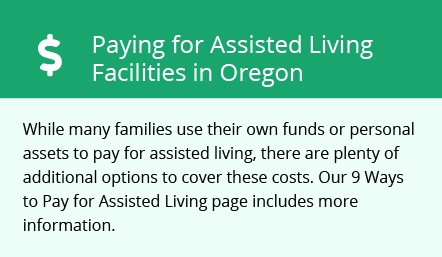 Springfield-area assisted living communities must adhere to the comprehensive set of state laws and regulations that all assisted living communities in Oregon are required to follow. Visit our Memory Care in Oregon page for more information about these laws.